Most of the time I have been asked if Paneer and Cheese are same? However, dairy industry consider them same but I have significant reasons to say that they are different. Cheese is a product of European origin. Rather, I should say, ‘they are’ products of European origin. There are more than 500 listed varieties of cheese. To prepare them, first, milk is cultured by some specific bacteria to raise acidity of milk with production of lactic acid. After this, rennet enzyme (an enzyme extracted from fourth stomach of calf) is added to it to give curd a thicker and particular consistency. After these steps, further steps may vary. Some cheese are further salted, waxed, sprinkled with spores or ripened. ‘Ripening’ is the key factor for specific flavour and texture of cheese. Some cheese are not ripened and they are called Fresh Cheese. Paneer is generally called a fresh verities of cheese. But, there is huge difference that nor any culture addition takes place while preparing neither any rennet addition. It is also not slated and cured. The taste of Paneer is also largely different from most of the cheeses. Paneer is consumed fresh and any delay in its consumption reduces its flavour. The Paneer available in Shopapni http://www.shopapni.in is a fresh product prepared from milk. You can check the flavour, test and texture. In India most verities of cheese are not available. The reason being, Indian climate is not suitable for cheese ripening. Here you must know that most cheese manufacturers still prepare cheese in traditional ways. They, in no way, try to build atmosphere to ripen cheese. We at shopapni http://www.shopapni.in also prepare Paneer fresh and in natural atmosphere. It is a genuine example of Paneer of Indian origin. If you consume milk and it causes indigestion which is associated with vomiting, gas, nausea and loose motion, you are most certainly suffering from lactose intolerance. Yea… remember, if you don’t like smell or flavour of milk, then you are not lactose intolerant, you just don’t like milk! If you are facing lactose intolerance, then instead of removing entire dairy from your meal, you should consume fermented dairy products, for example, Dahi, Curd, Sour milk, Matha etc. What actually happens in lactose intolerance is that a particular enzyme, Beta-galactosidase, native of colon, becomes unavailable in our small intestine. This enzyme helps in digestion of Lactose (milk sugar) by breaking it into glucose and galactose (Because our colon can not absorb Lactose as such). This glucose and galactose are further digested by other pathways in our colon and get absorbed. When galactosidase is not present or present in small numbers, lactose is not digested or improperly digested causing formation of gasses and other small compounds which cause diarrhea, vomiting, gas etc. Beta-galactosidase enzyme develops in our colon during our infancy when we take mother’s milk. This is a natural enzyme. Same enzyme is also produced by certain fungus and bacteria. Dahi is a production of such bacteria and yeasts only. They produce Beta-galactosidase enzyme which breaks lactose into glucose and galactose, which are further digested into lactic acid (this acid is responsible for sourness and curdling of milk, it is this acid only which gives sour taste to curd). So, when you consume Dahi, you are consuming already digested lactose, so your tummy will not have to worry for its load. Also, it is supplying Beta-galactosidase enzyme to your intestine and if you keep on consuming Dahi, someday, beta-galactosudase enzyme can be restored in the colon and you can again enjoy milk and its products! There are plenty of tablets are available in the market carrying Beta Galactosidase enzymes and also lactose free milk (how come it is a milk if lactose is not there? ), instead of taking them have Curd and Dahi in your meal. Tasty and natural way to restore your natural body. Here http://www.shopapni.in you will get fresh and unadulterated natural Dahi to help your body function properly! You may be hearing in news that plenty of synthetic or adulterated milk is out there and may be suspecting the milk you have is pure or not. You can check purity of milk to some extent at your home without visiting any Lab. This simple test will help you to know whether milk is real of synthetic. Prepare curd (Dahi) from the milk. For this, take milk, warm it and add a little amount of previously prepared Dahi (you can use Dahi available in the market, but its better use the loose one instead of packed). Keep it in warm place and observe after 24 Hours. If it is milk, smooth curd will form with a pleasant smell and sightly acidic and sweet test. But, if it is Synthetic milk, curd will not form. Even if it forms, it will be of very bad texture, frothy, smelling bad or like elastic. This test will only work to know milk is real or synthetic, if milk is adulterated, like sugar addition, water addition, starch addition, vegetable oil addition etc. then this test will not work. So… We all have been hearing about adulterated and synthetic milks nowadays. But… what are they actually? Are they all same or different? Adulterated and synthetic milk are different from each other. Milk is adulterated when something is added to milk or something is removed from it. Like…. if somebody mixes water to milk, or any powder or sugar or any chemical to preserve it (like hydrogen peroxide is the most common one which increases shelf life of raw milk), or Urea or any other substance which will make SNF and Fat look good, even if they are not. Also, if someone is removing something from milk, like its fat, and replacing it with some other oil, like Vegetable oil, this is also adulteration. Synthetic is pure sin. In this milk, nothing is actually milk. Its just a combination of some chemicals in water that will look white like milk and have a layer on top like cream. BUT… it is NOT milk. Its poison. Both of the milk can cause severe health concerns. Adulterated milk, if it does not have any harmful adulteration in it, it will cheat you on your money more than your health. But if there is any chemical adulteration, your health is going to get down. Synthetic milk!! DONT consume it at any cost!!! Even if its free!! It will cause you severe health concerns. How would you know milk is pure or not? There are various ways. BUT most of them are actually done by technical analyst or chemist. There are kits, there are tests…. BUT… every day you detect one chemical and they are ready with the new one!! Its difficult to know the purity of milk by your own. Shop Apni Serves… pure milk… No Adulteration and No Synthetic milk!! 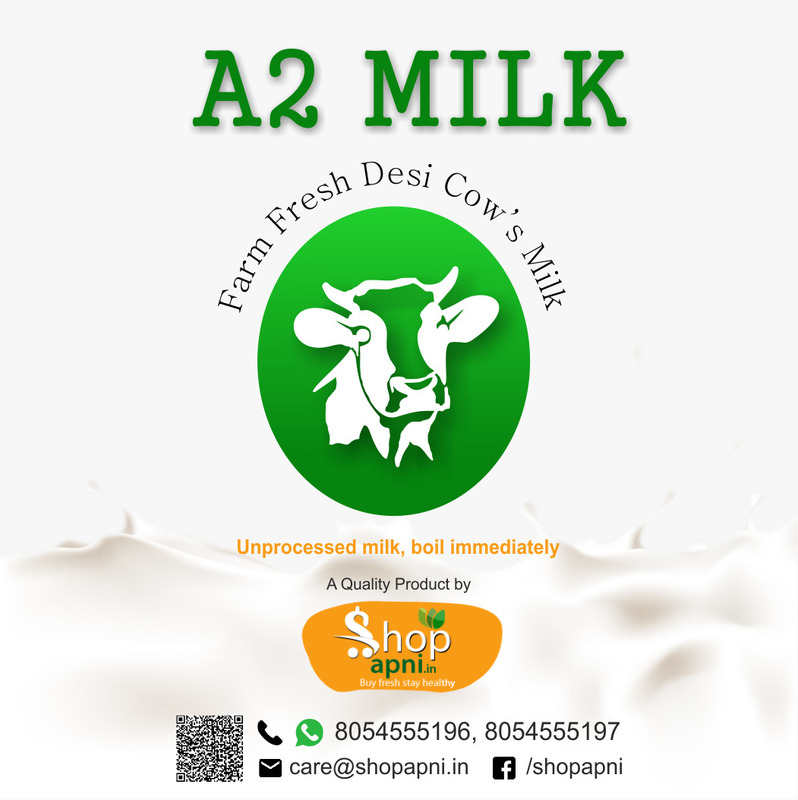 Shop Apni ensures you that the milk you are buying from us..,, is PURE MILK! It is a nectar for your health… like it should be. In 1905, a man published a research paper. The paper was about people who lived over hundred years. He met these people while he was traveling hills of Balkan region. In those hilly region there were people where three generations were living together… they were so healthy that even the eldest member was doing their own work. He stayed there to observe their life style. And he found out that those people had a unique habit of eating a fermented milk product everyday. Curious about the product this man wanted to know more about it. After many microscopic researches, what he found out that there was a bug… a tiny bug.. a germ… which was unique to this product…. was some how responsible for the long life of the people. He gave that germ a name, “Lactobacillus”. Initially, he thought, “This is a bad bug, which creates certain poison, and in order to fight this poison, body of these people become more immune”. And it was believed for a long time. Later many researches carried out and it was known that Lactobacillus is actually a good bug. It increases the immunity of body in many ways. Many researches followed, including animals and human trials, and this product became famous and famous. Promising it’s effect, it is still marketed largely. The name of the product was yogurt. It is from this bacteria and yogurt, a new term was originated, probiotics. So …, there are many people around the world who are consuming yogurt almost everyday. The technological advances have even isolated purest strain of lactobacilus proving it’s various health benefits, but, are there people around the world who are living over hundred years and still healthy? No. The reason behind it many be is that we are forgetting that yogurt was being consumed by people living in hills of Balkan. Not only their eating habit is different but also their life style, the atmosphere, the climate everything is different. Milk is naturally fermented into yogurt if handled carefully. Nature which was affecting life and body of Balkan people gave them a product which will help them to increases their immunity. While yogurt by factories, are being produced in artificially incubaters. People of any climate, any region with any life style are having it…. can we expect same result? Even in scientific researches, the surrounding is always kept same in order to repeat same results. So how can we expect same result in our body if we are not living as Balkans live? Yes, This is not published in any scientific journals yet. But science has open doors … who knows one day someone notices what Ellie Metchnikoff missed … “To observe whole”. The name of the product is Yogurt. The name of the man is Ellie Metchnikoff. He is known as the father of fermented milk products. Well there is no story of milk, there are only facts ! Milk, once regarded as an elixir has turned in to a white poison these days. Adulteration in milk doesn’t surprise us anymore, somehow it has been accepted as a part of our destiny. Long ago when milk was used not to be a commercial item, and when cattle rearing was not a business, there was no point of adulteration in the milk. Adulteration basically is a result of human greed which emanated post white-revolution. Apparently the evil concept of “More production, More Profit” ruined everything. Our journey with milk should be seen in different phases…. 1. In first phase there was no business of milk, either families used to exchange it against some other goods or it was their own produce as most of people were having their own cattle at home. 2. In the second phase, when farmers were encouraged for more production and various cooperative dairies were being established, human greed played it’s role and farmers started to add water to their milk for more volume and hence more money. It didn’t stop here, rather it was just a beginning of adulteration in milk. As the companies started to purchase milk on the basis of it’s fat content, farmers started to add refined oil to increase fat content. Detergent is used to as an emulsifier in order to obtain stable emulsion. What we need to understand that milk is not just a chemical solution as described by modern dairy technocrats(terrorists) . Such notorious perception is created by education mafia to keep the public away from the Truth. As soon as you perceive milk as a chemical compound your conscience allows you for further experimentation on milk which ultimately leads to adulteration. Once I asked a question to General Manager of one of a reputed dairy brand “will you pass the sample of milk if it satisfies all you parameters of fat, SNF, protein and RM strength, but there is no MILK in that solution”, his reply was straight and simple “Yes” ! This phase is still going on and people are either forced to consume poisoned packaged milk or they are deliberately consuming such chemical solution in the name of milk due to it’s cheaper prices. 3. Well the third phase is even more dangerous. People are fed up of adulteration and they are looking for purity in milk, our governments started to promote dairy farmers. They were given loans and various subsidies under government schemes for raising foreign or hybrid breeds of cows such as HF and Jersey. Sadly their milk is also not even worth calling “milk”. As I said in the beginning , Milk is an elixir for us, but for westerners milk has never been that important part of their diet. Reason being, milk of foreign breed cows is A1 class of milk which is not suitable for human consumption. Most suitable milk for humans is A2 type of milk which is given by our indigenous breeds of cows such as Sahiwal, Belahi, Kakrej and many others. As soon as we woke up to this truth we observed that our indigenous cows have either been slaughtered or they are completely removed from our country through by crossing these breeds with foreign breeds. This realisation drives us in to fourth phase…. Who- is responsible for this? White revolution? Crooks like Verghese Courien? India Gandhi? USA? Or some other conspiracy? I reckon we ourselves are responsible for our plight and nobody else. Packaged milk is no less than slow poison, A1 milk also leads to various diseases in children as proven in recent studies. The only genuine milk in the world is milk of Indian cows. Alternate can be buffalo’s milk , goat’s milk in some cases and none other.